Okay, the verdict is – this was so much fun! Naturally, I did beginner because I haven’t worked out in way, way, way too long. I intended to do 30 minutes – I ended up doing closer to 45. The beginner workout was 16 minutes and included a warm-up, latin dance, cardio boxing, jump roping, and a cool down. I enjoyed it all, but got particularly addicted to the jump roping. Essentially, you stand on the balance board and do a calf lift everytime you want to jump….there are 7 buff guys (2 holding the rope, and 5 that eventually try to get in the rope with you). At the beginning, I tripped on the rope. A lot. But then I got my groove. I ended up playing the mini-games 2 more times just so I could complete the full jump rope combo and get all those boys jumping with me! Once I excelled at the jump roping, I then tried the other mini games: Matador (didn’t like it – couldn’t escape the bulls); Bull Riding (didn’t like it – couldn’t quit getting bucked off); Canoeing (Loved it! You sit on the balance board and row to escape alligators – great fun! ); Marathon Race (Okay…you basically pump your arms in order to get your person to run faster – I couldn’t quite master it and kept getting hit by the lions); Sword Fight (Loved it! You swing your arms like a sword and try to cut branches in the direction the game instructs you to…..and avoid ninjas). I will probaby order a second wii remote because it only detects the arms movements of whatever hand has the remote – so you can be rated poorly for missed actions without that second remote. Not a huge deal – but it is recommended that you use two remotes (although it is totally do-able with just one). All in all – this is great fun and I am excited to do it again! Teena ~ It was. I had a great time! I'm totally jealous. i want a wii fit SO bad! Beth ~ I got mine off of QVC with the extended payment plan. It was the only way I could afford it. Sounds great, Dev 😀 I bought the Wii Fit not too long ago, intending to exercise… and instead, I got addicted to Mario Bros Wii LOL. This looks fab! I want this! Nath ~ I haven't done any gaming at all on my wii – just exercise. It's fun! Okay, I need to get my Wii fit out of the box from Christmas this past year then. Bad Cindy. Thanks for coming to my party tonight. 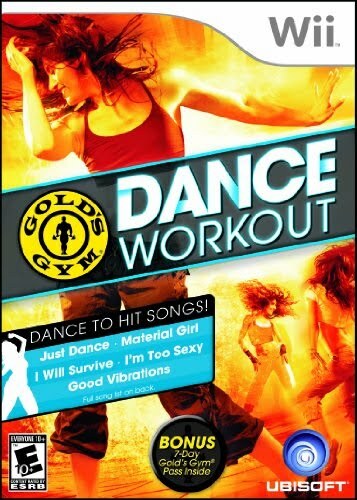 This Wii dance workout sounds fun. I'm going to have to put that on my wish list for x-mas, it will be here before you know it.